This was not one of those Ultimate NHL Playoff sweeps where one team absolutely lights it up offensively while completely shutting it down defensively. The 24th-seeded ’84-’85 Washington Capitals were able to shut the 41st-seeded ’15-’16 Winnipeg Jets down, but didn’t exactly blow the doors off in the opposite end. The Capitals averaged 4.50 goals per game, which is 8th-best in the tournament so far, but scoring is somewhat down from last year. 14 different players registered a point for the Capitals in the series while eight different players scored a goal. Mike Gartner, of course, was Washington’s leading scorer with nine points over the four games. 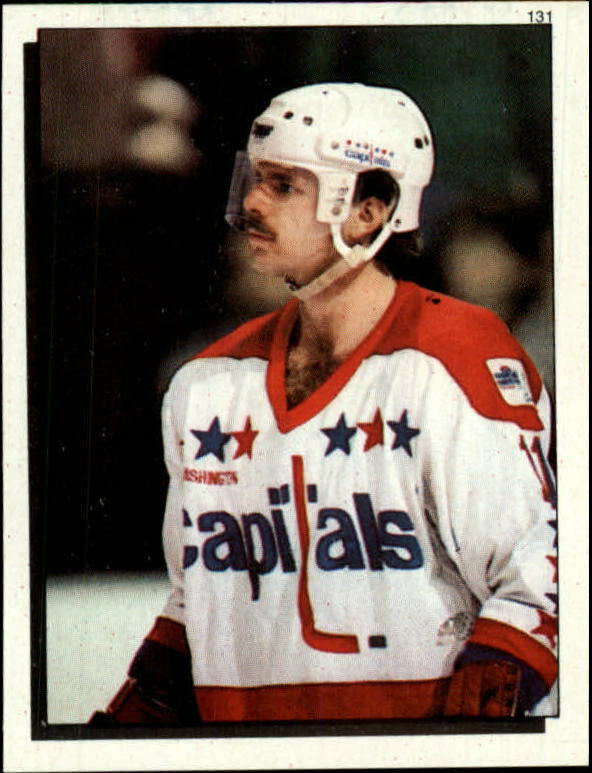 His line mate Bob Carpenter was second behind him with six points. Carpenter was the team’s leading goal-scorer with five genos while Gartner was a close second with four. Gartner was also tied for the team lead in assists at five with defenseman Larry Murphy. One little side note before we get to their goaltending, there was an ejection in this series for the Capitals. Defenseman Scott Stevens, shocker, was ejected in Game 3 of this series for head-butting, how nice. Goaltender Pat Riggin was not all that busy this series. He faced only 28 shots against per game as he posted a 4-0-0 record with a 1.75 goals against average and a .938 save percentage. He pitched one of the easiest shutouts I can remember with just a 19-save performance in a 6-0 Game 1 win. Hey, at least the Jets won the special teams battle. Their PP went 2-for-7 for a 28.6% rate while their PK allowed one goal on five opportunities for an 80.0% rate. Other than that for Winnipeg, ehh. Mark Scheifele led them in scoring with five points and was the only player to register more than one assist with four. Blake Wheeler was second behind Scheifele in scoring with four points. He was the only Jet to score more than once with his three goals in the series. Only four other players actually scored a goal for Winnipeg, one of them being Scheifele. Defenseman Dustin Byfuglien and Andrew Ladd both finished with two points, the only other Jets to finish with more than one point. In goal, Ondrej Pavelec started all four games, but had to be relieved by backup Connor Hellebuyck twice in this series. Pavelec registered all four losses for the Jets in the series and posted a 4.00 goals against average and a .881 save percentage. Meanwhile, Hellebucyk, in his limited time, allowed 1 goal on 22 shots for a .955 save percentage. The ’84-’85 Capitals are making their UNP debut and are the third different team to represent Washington in the tournament. This is the second straight tournament that the Washington rep has advanced from the First Round. In the Second Round, the Caps will face the 9th-seeded ’81-’82 New York Islanders, who are making their second consecutive appearance. The second-coming of the Jets are now 0-for-3 in the First Round of the UNP. The ’15-’16 Jets are the third different team for them to fail to get out of the opening round. Next up in the First Round, the 30th-seeded ’85-’86 Hartford Whalers face the 35th-seeded ’14-’15 Minnesota Wild! This entry was posted in 1st Round, Ultimate NHL Playoff and tagged Alan Haworth, Andrew Ladd, Blake Wheeler, Bob Carpenter, Connor Hellebucyk, Dustin Byfuglien, First Round, Larry Murphy, Mark Scheifele, Mike Gartner, Ondrej Pavelec, Pat Riggin, Rod Langway, Scott Stevens, Ultimate NHL Playoff, Washington Capitals, Winnipeg Jets. Bookmark the permalink.